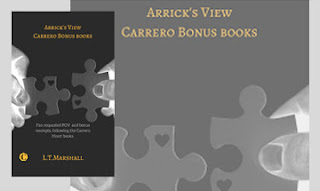 It is now only four days to the second bonus book in my Carrero Series – Arrick’s view. The much awaited complimentary addition to the Heart books, which are already on sale on Amazon. The Carrero Heart – Beginning , which sees our best friend duo Sophie and Arrick come to face the fact that her feelings for him have grown to so much more and the train wreck that follows as they try to figure out how they feel about each other. The Carrero Heart – The journey, is the aftermath of the climatic end to the first book. Torn apart, feelings hurt and hearts broken. The duo are re-united at a family affair and have to face what future there is for them together. What is a bonus book? A bonus book is a bunch of selected scenes and chapters from set books that enhance the story by giving a new perspective. It can also have some added fun extras, such as character interviews. An alternate point of view from a main character, his thoughts and feelings in scenes that were detrimental to the original books. A new insight into their actions and some new scenes about what they were doing when absent in the original scenes. Why should I read it after I have read the others? It gives you a wider understanding of why certain parts of the books played out the way they did, a deeper understanding. It can help put situations in perspective and give you more insight and connection to a main character. Why do fans like them? They love to see the male point of view in my love stories, to know the turmoil they were also going through. They love to have something more than just the main books for their collection as it just enhances the experiences and makes the characters more real. What can I expect in Arrick’s book? I have a good assortment of the fan requested chapters in Arrick’s POV, also one from Natasha, and one extra scene from Sophie on how they first met. I also included the 2 brother interviews from my blog, and the Christmas bonus that went to my email sub list. It’s a collectors book so all of that will be valued just as much.